China has 56 ethnic groups. Many of them still remain mysterious to the outside world with their own unique culture, customs and beautiful natural living surroundings. 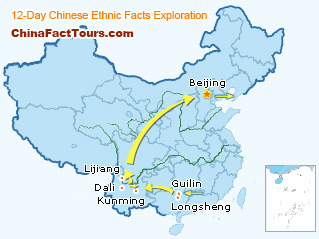 This China ethnic facts tour offers what you want in China! Be met at the airport and picked up to the hotel. The rest of the day is at leisure. After breakfast, you will have a Li River Cruise to Yangshuo. It will take you 3.5-5rs to enjoy the most beautiful karst landscape in the world. Pay a short visit to the West Street in Yangshuo and then drive back to Guilin. This morning, you will transfer to Longshen to see the stunning Dragon’s Backbone (Longji)--the terraced fields wind from the foot to the top of the mountains. It will take you 40 minutes to walk up the stone covered paths and steps. Visit the Zhuang Ping'an village, the different minority customs and local people's dressing style are specially delicate and beautiful. Drive back to Guilin. Visit the Symbol of Guilin—Elephant Trunk Hill and the most fantastic cave in south China—Reed Flute Cave. Transfer to Kunming by plane. Drive about 90km to see the popeyed world natural wonder--The Stone Forest. After that, visit the Sani Minority Villages-- These ancient ideologically isolated villages are famous for their beautiful ethnic garments, mystical ancient traditions and beliefs. Take morning flight to Dali. Check in the hotel then visit the Chongsheng Temple Pagodas, Houses of Bai People in Xizhou and the ancient town of Dali. In the morning, transfer to Lijiang by bus. Explore the Ancient City of Lijiang—the hometown of Naxi people. Visit the beautiful Black Dragon Pool, where you can have a distant admiration of the Jade Dragon Snow Mountain. Have a full day sightseeing includes the Yak Meadow--one of the part of Jade Dragon Snow Mountain, living the Yi and Zang Minorities. It has many attractions, such as the Snowy Valley, the special Yak Glacier, the colorful Meadow and primitive Pine Tree Forest; the Mural in Baisha Village--its characteristic artistic style and precious historic content of the murals look smashing, but few people know of its existence; the Yufeng Lamasery--built in the Qing Dynasty and famous for camellias in the temple. Today you will be picked up to the airport for the flight to Beijing (The plane may stop over at Kunming for a moment). The free time is on your own arrangement today. In the morning, explore the mysterious Imperial Palace--aka the Forbidden City, which is home to 24 Emperors between 1420 and 1911; admire the Tiananmen Square—the largest city square in the world, which is surrounded by many imposing buildings, such as the Gate of Heavenly Peace, Museums, government buildings and Chairman Mao's Mausoleum etc. In the afternoon, visit the Temple of Heaven—one of the most famous ancient buildings in Beijing. In the evening, experience local culture at the Beijing Opera including a behind-the-scenes look at the colorful make-up being applied to the performers. In the evening, enjoy the Beijing Roast Duck Dinner—a delicious time-honored brand food in China, which can be dated back to more than 100 years ago. After breakfast, you will be driven to visit the Mutianyu Great Wall—one of famous sections of the Great Wall of China, about 1 hours drive from Beijing downtown, this section is less touristy than Badaling Great Wall. It includes cable car tickets up and down; in the afternoon, visit the Sacred Way and the Ming Tombs (Chang Ling). Be picked up to the airport for your homebound flight (your own arrangement). The hotel accommodation is based on two persons sharing one twin room with private facilities. All transportation, transfers and tours with private guide and car or van in each destination. 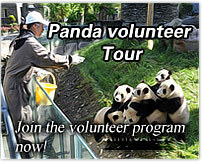 All the admission tickets, English speaking guide service. Daily breakfast at the hotel, Chinese lunch and dinner with one cup of soft drink are offered outside the hotel or in the hotel as specified in the itinerary. Gratitude to guide and driver is not included. Expenses of a personal nature such as laundry, drinks, telex, optional activities or sightseeing, telephone calls or overweight baggage charges or meals not indicated etc.